Ok, so technically it's not Wednesday anymore. In fact there is nothing technical about it. It's Thursday. In my defense, however, the long weekend has thrown me out, and today feels like a Wednesday. So, because I didn't get time to share with you yesterday my Wonderful Book of the Week, I'm sharing it now. All I can say about this book is OMG! It is unreal! See those little 'ornaments' on the front cover...those are decorated cookies. And all of them are included in this book. The designs range from the incredibly intricate to totally simple. The book is split into three sections, Recipes & Techniques, Cookie Inspirations and Shipping & Party Planning. Recipes & Techniques covers all the basics to get you started making your cookies, simple recipes and basic techniques and all the tools you'll need. 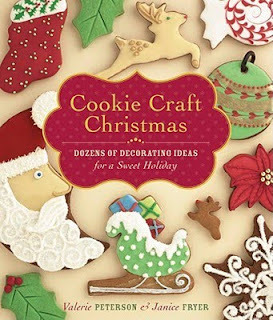 Cookie Inspirations gives you step-by-step instructions for all the designs you've seen on the front cover plus more. Shipping & Party Planning gives you handy hints, tips & ideas on how to send your gorgeous cookies to friends and family who don't live close by. There's also some fabulous ideas for holding your own cookie swap party. I'm not much into making cookies myself, but I love to eat them, so I will def. be getting this book for my friend K who loves to bake. I'm pretty sure I can convince her to make a few of these for me! This book looks like fun and yummy!